This is another Chinese restaurant and shopping mall food court favorite and now you can even find it in a supermarket deli counter. And no wonder. 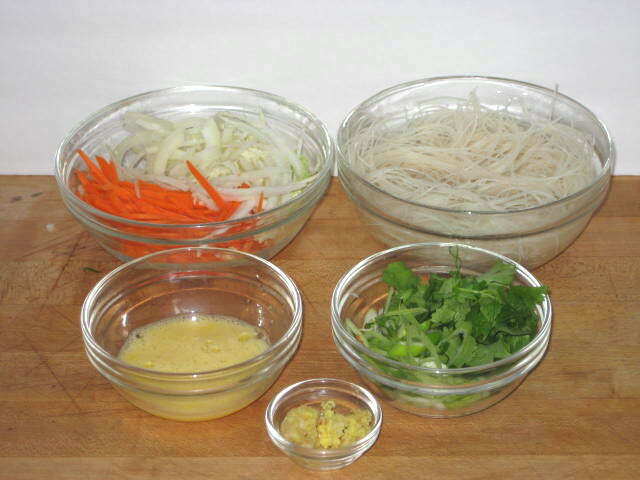 It is fairly healthy, depending on amount of oil used, and quick and easy to prepare. As with most Chinese dishes the hardest and most tedious part is julienning all the vegetables. If you want a decent looking dish it just has to be done by hand. If you don’t care what the dish looks like a grater does a decent job. I use my trusty super sharp 40 year old Chinese clever and have it chopped in no time. Again, use any vegetable you have on hand but every version should have carrots, green and cooking onions, ginger, garlic and scrambled eggs. 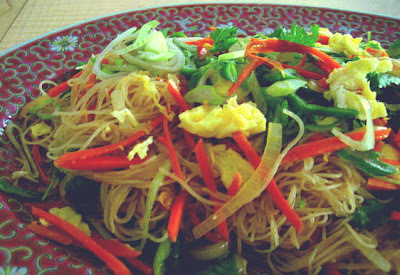 Soak vermicelli in very hot salty water for 15 minutes, drain, separate strands and sprinkle with sesame oil and toss to coat. In a hot wok or non-stick frying pan heat 1 tsp of peanut and few drops of sesame oil. Pour in egg beaten with little salt and scramble. When egg is still moist remove to large preheated bowl and reserve. Add another scant tsp. of oil into wok and stir fry carrots for 2 minutes then add cabbage or bean sprouts, cooking onions, half of coriander and half of green onions. Add Tbs. of Hoi Sin sauce, 1 tsp. sugar, 1 Tbs. soy sauce and 1 Tbs. stock or water. 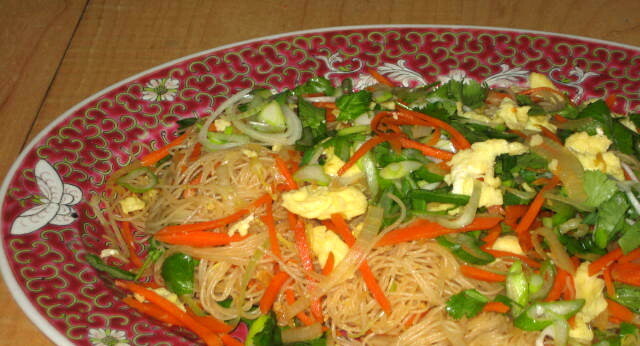 When hot, add vermicelli and combine all ingredients. Stir fry till vermicelli are soft but still with a lot of bite. Add stock or water as required. Remove to bowl with egg and combine. Serve and sprinkle with remaining coriander and green onions.